John McCain — Did his plane fire missile and kill U.S. soldiers aboard ship? In the days following the death of Sen. John McCain on Aug. 25, numerous readers have inquired about a claim that the Arizona Republican was responsible for the deaths of more than 100 sailors aboard the USS Forrestal. He wasn’t. The recycled falsehood distorts the facts about that July 1967 disaster off the coast of Vietnam, which we wrote about in 2008 when McCain sought the presidency. There is no evidence McCain was responsible for the accident, which claimed 134 lives, injured another 161 and almost killed McCain. A website known for promulgating fictitious stories repeated the claim nonetheless — falsely citing a decade-old Washington Post fact-checking report as evidence. “John McCain fudged his navy record and desperately tried to hide the fact that he ‘accidentally’ killed 134 American sailors, according to the Washington Post,” begins the Aug. 27 story on Your News Wire. The piece was published two days after McCain’s death, and the same or similar deceptions were posted on other websites. In reality, the 2008 Washington Post story never said McCain was responsible for the accident. The most critical part of the piece actually centered on a nonfatal 1960 plane crash from when McCain was in flight school in Corpus Christi, Texas. The Post story challenged a statement made in McCain’s autobiography that the 1960 crash was due to engine failure. An official Navy report that was obtained by the Los Angeles Times found that wasn’t the case. Los Angeles Times, Oct. 6, 2008: Investigators determined that McCain was watching instruments in his cockpit that indicated the position of his landing gear and had lost track of his altitude and speed. Years later, in July 1967, McCain was aboard the carrier USS Forrestal when a missile that was fired accidentally from an aircraft hit another plane, sparking the deadly fire and explosions. It wasn’t clear whose plane the missile struck. McCain said the missile hit his plane, but records indicated that it likely struck the plane that was next to his. Still, there is no credible assertion that McCain, then a lieutenant commander, was to blame for that accident. The Navy awarded McCain the Silver Star for his “conspicuous gallantry” while he was imprisoned for nearly five-and-a-half years. He also received the Distinguished Flying Cross, three Bronze Stars, two Purple Hearts and the Prisoner-of-War medal. Update, Aug. 29: After we published this article, Your News Wire updated its headline and story to remove the false claim that McCain was responsible for the deaths in the 1967 USS Forrestal disaster. “There is no evidence for this,” the website said in its correction. Dobbs, Michael. “McCain fudges his Navy record.” Washington Post. 6 Oct 2008. Jackson, Brooks. “McCain’s Plane Crashes.” FactCheck.org. 5 Sept 2008. 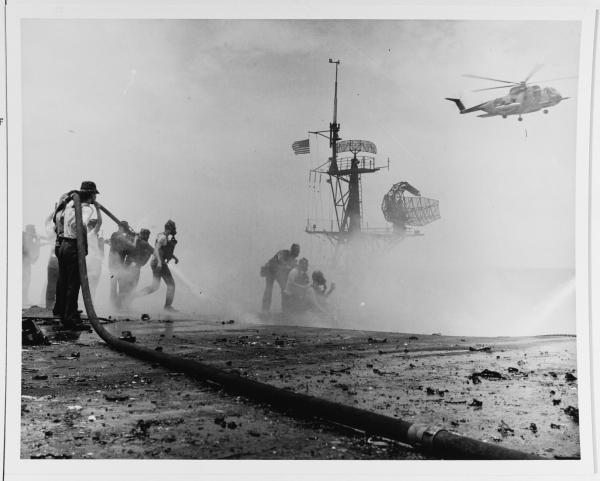 “The Catastrophic Fire On Board USS Forrestal (CVA-59).” The Naval History and Heritage Command. 5 Dec 2017. Vartabedian, Ralph, and Richard A. Serrano. “McCain’s mishaps in the cockpit.” Los Angeles Times. 6 Oct 2008. "McCain ‘Accidentally’ Killed 134 U.S. Soldiers While Serving In Navy"